My KitNipBox arrived today, a day my cats now know as: Best. Day. Ever!!! What’s a KitNipBox? Oh, just a box filled with the newest, funnest, highest quality cat toys and treats, that you can have delivered every month as a subscription. 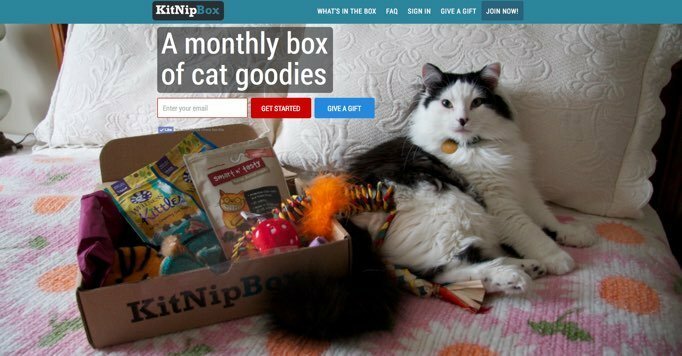 It’s easy to sign-up and you will get your first KitNipBox within 3-8 business days, once it’s shipped. I got mine as a free sample to write this review but as you can see by the video I made, this would make an excellent holiday gift for any cat owner. All of the products were pretested by their Chief Meow Officer, Sylvester and his band of merry cats. They even have a “tell us about your cat” during your order, so you can inform them of your cats special needs. I have five cats. They are all rescues off the mean streets of Brooklyn. It’s been tricky calming them all down from their formerly traumatic lives, and getting them to be friends with each other. Finding ways for them to interact playfully has been key to their happiness. So, a box FULL of awesome toys and treats? THEY WERE SO HAPPY TO GET THIS! First of all, they loved the KitNipBox itself. It smelled like cat nip. They all took turns checking it out. It was a holiday themed box, filled with cute brightly colored toys. It came with a card and description of everything in the box. The toys were wrapped in tissue paper. My cats LOVE TISSUE PAPER! It was very fun just opening the box. They couldn’t wait to play with everything inside. It really made me happy to see them so excited. The Handmade Liwiki’s Winter Kicker is a long fabric tube filled with catnip, topped with a feather. The idea is cats will grab it and kick it, which is exactly what happened right away! Caramellow hogged that toy and kicked at it, happily. Awesome toy! The Holiday Feather Wand by Sisal has feathers, ribbons and bells on the end of an elastic string. My cats were transfixed! They chased it all over the apartment. This toy is great for group play. They did strong team-building, cornering the feather invader, taking turns taking it down. Super cute times! Sisal’s Feather Toy is a textured cylinder that makes if fun for cats to dig their claws in as they play. It’s wrapped in colorful eco-friendly thin rope. My cats liked to chase this thing. Tiger got possessive with it. I have to teach him sharing! Great toy, especially the scratchable element. Crinkle Present Cat Toy by Cat Think is a small yellow square filled with cat nip, wrapped like a present in ribbon. I find yellow to be a great cat color for toys. This was a perfect toy for my senior cat, Betsy. It’s yellow, and soft, and cat nip. She face-planted on it right away, and then moved it around with her face. She is a calico: they are wacky! This toy gets the calico seal of approval! Handmade Catnip Mitten by the Vegan Cat is a carefully made toy, using only vegan materials. The soft, felt mitten filled with organic cat nip was too irresistible! The cats went entirely bananas! I think Tiger won the day (again). He’s kinda the boss cat. Terrific toy! Environmentally conscious! Love it! Handmade Kitty Scarf by the Vegan Cat is an adorable SO SOFT, tartan mini-scarf. Your cats can wear it for holiday photo-ops! The Vegan Cat even included Kitty Scarf styling suggestions–so CUTE!! Now, as I mentioned earlier, my cats are still a little wild, semi-feral, so putting them in winter-wear is not possible. But I’m sure there are very compliant cats out there who will look SO ADORABLE wearing this little scarf. I’m hoping my cats calm down and they’ll be ready for it by next year! After my cats played with all these wonderful toys, it was treat-time! Canidae Grain-Free Pure Taste Treats were included in my KitNipBox. Oh boy! Excellent choice, KitNip! I have not had a lot of success with “healthy” treats in the past, but ALL FIVE CATS loved these Game Bird Recipe crunchy treats. Ooh, also came with coupons! Yay! The treats have a very short list of ingredients, nothing I can’t pronounce. It’s just protein, sweet potato and vitamin E. And vitamin yum, I guess. Cats Delighted! Different subscriptions are available, for different lengths of time, and for single-cat or multi-cat households. There are also no-treat boxes for cats on a diet or with dietary restrictions. KitNipBox is offering you readers of cattime.com, a special discount code, so you too can give your cats their best day ever for 15% off! The code is : CATTIME15 Just go to kitnipbox.com and enter the code is “CATTIME15” on the checkout page. Your Holiday Shopping is done! Just buy KitNipBox for all the cat people and cats on your list!